WHAT IS A BALLOT QUESTION? Under Massachusetts law, after gathering the required signatures, citizens can propose a ballot initiative, which if passes becomes law. 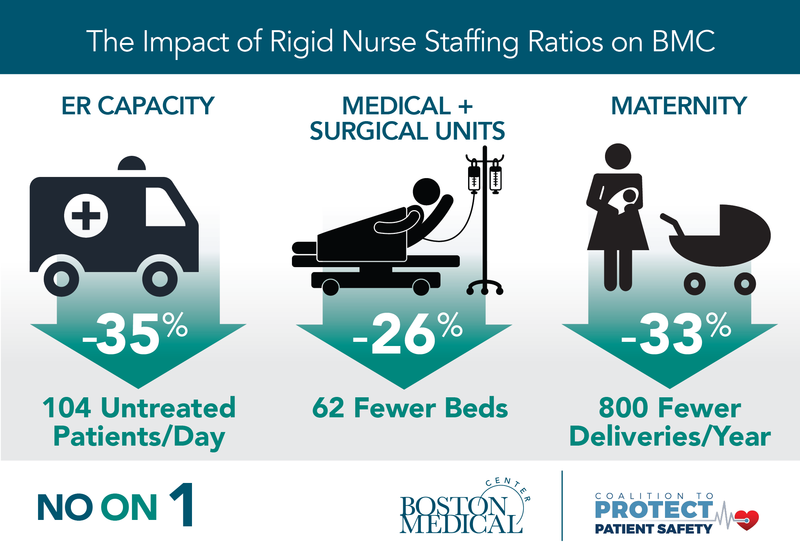 Question 1 imposes rigid, expensive, and unproven nurse-to-patient staffing ratios in all units, at all times, at every hospital across Massachusetts — regardless of a hospital’s size, location, or unique patient needs. WHO SUPPORTS THIS BALLOT QUESTION? The Massachusetts Nurses Association, a union representing less than 25% of Massachusetts nurses, is responsible for the ballot question. Every hospital in Massachusetts and many professional nursing organizations in the state, including the Mass. chapters of the American Association of Nurses and Emergency Nurses Association, oppose the law. 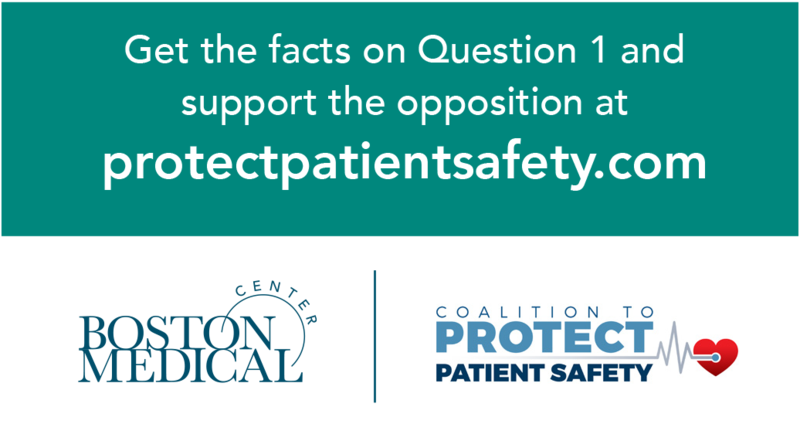 Concerned by the unintended consequences this unsound and costly law would have, Boston Medical Center has joined with other Massachusetts hospitals, nurses, doctors, and healthcare professionals to form the Coalition to Protect Patient Safety in opposition to the law. Every hospital in Massachusetts and many professional nursing organizations in the state oppose the law. WHY DOES BMC OPPOSE THE BALLOT QUESTION? BMC opposes the ballot question because staffing decisions would be taken out of the hands of experienced nurses and doctors and given over to a bureaucratic government mandate. Mandated ratios would disregard the professional judgment of qualified healthcare professionals, threaten the quality of care, and increase costs to patients. There are no exceptions to this law. It would deprive hospitals of the flexibility to make critical and timely decisions, even in the event of a sudden influx of patients due to a mass-casualty event or other emergency. The law will destabilize our healthcare system without any improvement to patient care. HOW WOULD THE LAW AFFECT BMC? 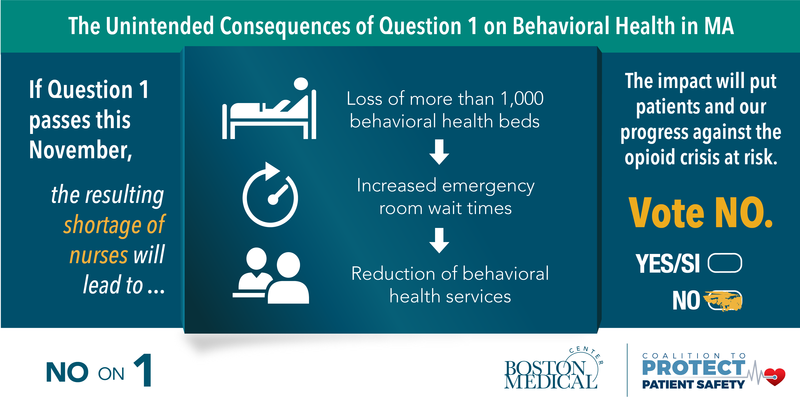 If Question 1 passes, the law would have a significant and immediate impact on BMC. The one-size-fits-all ratios would result in longer patient wait times, reduced services, and higher operating costs across the hospital. Clinical leadership has estimated that the law would reduce the daily capacity of the Emergency Department by more than 100 patients per day and the number of births at BMC by 800 per year. Additionally, to meet the overwhelming cost of this unfunded mandate, BMC would have to cut vital community health programs and make other difficult decisions. IS THERE ANY EVIDENCE THIS WOULD IMPROVE HEALTH CARE? No. There are no scientific studies or reports that show the law would improve the quality of care for patients. Nor are there any studies that support or recommend specific, at-all-times ratios for nurses. In California, the only state that has imposed mandated ratios, there is no evidence that the mandate has improved the quality of care. In fact, Massachusetts hospitals already equal or exceed California hospitals in nearly every meaningful measure of patient care. IF A NURSING UNIT IS UNDERSTAFFED, WOULD THIS LAW HELP? No. Leadership recognizes there are times when nurses (RNs and Nursing Assistants) don’t have the resources they wish they had. This is not the solution and would have a devastating impact on BMC and the patients we care for.